Lanyuan Park is located next to the Changzhou Women and Children Activity Center. If you were to walk away from downtown, go over a bridge, you would pass this building. The street name changes from Nandajie to others several times, but it is the same road. This is a building maintained by the municipal government, and it works as an educational resource center. There, families have access to discounted educational programs that cover everything from English lessons to art and more. So, it is fitting to find statues of children in the adjoining park. One is a group of kids craved from white stone. It depicts two boys and two girls holding on to each other in what looks like a conga line. Their expressions are mostly of mischief. One boy, at the end, is falling down, but he has his hands on the belt line of a girl’s trousers, suggesting he is about to accidentally pull her pants down. The other statue is worked into fountain. A boy and a girls are laying down and watching the water splash into the pool below. Again, because there is a family oriented governmental building nearby, this makes sense. There is an odd juxtaposition, though, in Lanyuan. It is strange, surreal, and oddly beautiful. A series of concrete planters showcases bamboo thatches. There is a bronze-looking metal sculpture of two people sitting on a bench. They have no faces and the are huddled together, wrapped in a single blanket. Are they refugees? Old people? It’s hard to tell when the front of their heads are smooth and featureless. If I was had to guess, I would have to go with the elderly. That’s just a snap judgement based on my experiences in Changzhou’s public parks. Often, you will see the elderly sleeping and exercising in most public parks. Lanyuan is no different. Even during hot and humid days, you can see somebody’s grandfather swinging and flailing is arms while walking in circles. I once saw a guy doing the “raise the roof” gesture with his upturned palms in the air. It’s not just the weird excercise. My favorite was an old guy who used to wear a white tanktop and a red sweatband around his head. In one hand, he held a portable radio. At the top of his lungs, he belted out Chinese opera. No matter where you went in Lanyuan, you could hear him. Laozi 老子 — also known as Lao-Tze or Lao-Tzu — is one of the most central and venerated writers in Daoism. He penned the Dao De Jing, which is a foundation text in Chinese and Asian thought. If you walk into a Daoist / Taoist temple, you are bound to find a statue of this guy somewhere. He is usually smiling. You also sometimes just find statues of him in seemingly random places. Like some figures also found in Buddhism, he can be taken in two roles. Some look up on as a philosophical figure and appreciate his thinking; others view him as a religious figure in Taoism that can be worshiped and prayed to. Laozi is often considered a contemporary of Confucius, and the two belief systems contrast. Confucius tends to be a realist, and Laozi tends to be more ideal. Confucius writes about how to fit into the social world around you, and Laozi does not. He was more interested in the greater world within. Even though he seems to be speaking of internalizing things, his statues usually have him smiling. You also sometimes just find statues of him in seemingly random places. I found him once in a semi-abandoned Tibetan Spring Garden 藏春园 in Louxi. This is a township out towards Changzhou’s airport in Xinbei Somebody who used to live in the area once told me a restaurant used to be a main attraction, but it packed up and moved. As for the statue itself, Laozi is sitting with a young student and expounding his considerable wisdom. It was hard to get a good picture since the statue was slightly overgrown. It was first published in Life Magazine in 1945, and it has gone on to become an iconic image of victory at the end of World War Two. In a picture, a sailor holds a nurse in his hands, dips her, and gives her a deep, long kiss. It must have been a good one, too. The woman looks like she’s practically melting in his arms. 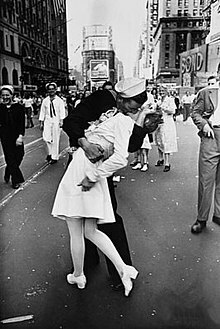 This took place in Times Square in New York City, right after announcements that Japan had officially surrendered, the and bloodiest war in human history was now something for the history books. For a long time, the identities of the two smoochers remained unknown. The sailor was a guy named George Mendonsa. He was on a first date with his future wife-to-be. Only, his girlfriend isn’t the one he kissed in the picture. She actually watched. Her date, George, after hearing the news, rush up the first nurse he saw and planted the now iconic kiss. Was his date angry? Oddly enough, no. George was swept with the memory of nurses and acted impulsively. The woman in the picture actually didn’t want to be kissed in the first place. However, the real story doesn’t live up to people’s imaginations. This photo has lived on as part of “Americana.” Just like Marilyn Monroe’s fluttering skirt, it has turned up in Changzhou. Xinbei’s new Risesun Manhattan Plaza has a statue of the sailor and the nurse. Marilyn is clearly visible from the street, but the kissing couple takes a bit of walking to find. It’s located on the side of shopping center where storefronts still remain empty. There is also still a construction barricade on the other side.